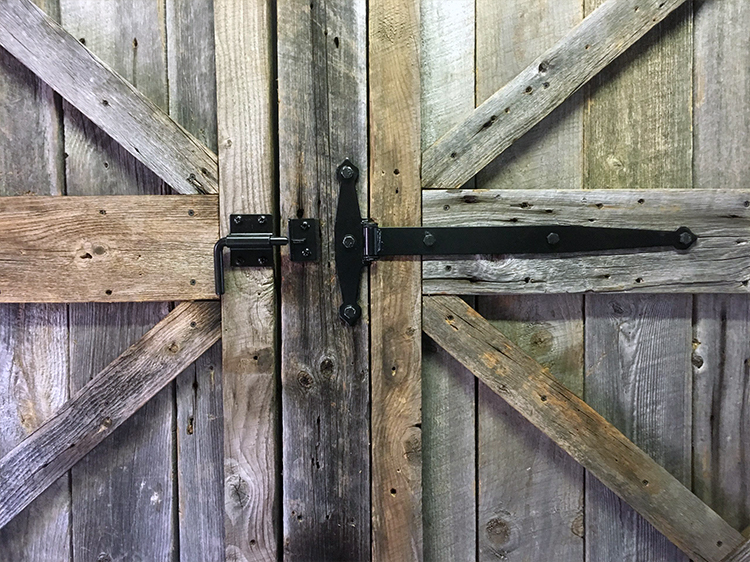 Barn doors made from 80-year-olde gray rough cut wood, nautical cleats for handles, 300-year-old pine, rain drop pattern window triptychs: one-of-a-kind designs that make your home or commercial spaces unique. Stacey has an extensive background in interior design. She has a keen eye for juxtaposed colors and styles and mixes California styles with those of her beautiful New England home in Wenham, Massachusetts.. The Barndoorist created these 5’ x 7’ doors with the same pattern on both sides and so they are nearly 3” thick. Since many old boards came in varied thicknesses, some boards were planed to assemble and a shiplap was used to tie each vertical board to the next. Lots of olde saw mill-styled craftsmanship went into the construction of these doors. Special parts were fashioned in the shop by The Barndoorist by hand and hammering to create large, heavy metal brackets that could support hundreds of pounds of wood that hang out as far as 9” from the wall. For design reasons Stacey’s husband opened the wall up above the entry and The Barndoorist added wood blocking between every stud and sealed it up with wallboard and joint compound. Her family sanded and re-painted the area as they had been doing a lot of work in the room anyway. 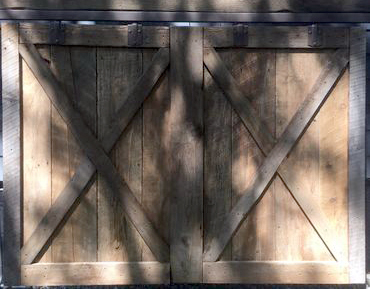 The Barndoorist cut in measured spots for each of the six large brackets and they were set in place. Then the rails were assembled and both large doors were hung in place. 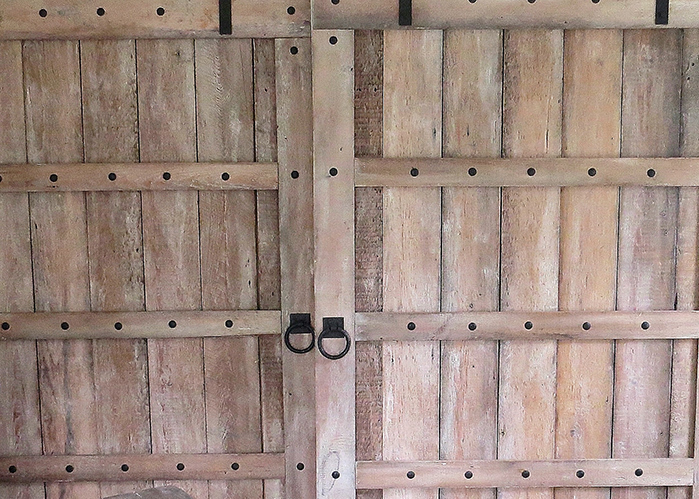 Side pieces were added on site where needed to help mitigate gaps between both doors and this added detail remains a signature feature of The Barndoorist’s work and care. When the family had finished the room, the results spoke for themselves, bringing forth one of our greatest beautiful functional art door projects! Chris in North Andover, Massachusetts wanted a big door to compliment the large side room off their home's living room. This room served as an office and also a space for people to chat during holiday parties. Off to one side was a small space that could be used for a study with a computer for the kids and also a good place for the dog crate if needed. The barn door that was created used 300-year-olde pine and had a window mounted in it made from tempered glass with a rain drop pattern for style. A frame was made using barn wood to make it look like three panes. Metal was added to the door design to make it look more bold and rustic. The header beam of barn wood spanning the room was complimented by one made just like it for the other side of the space. 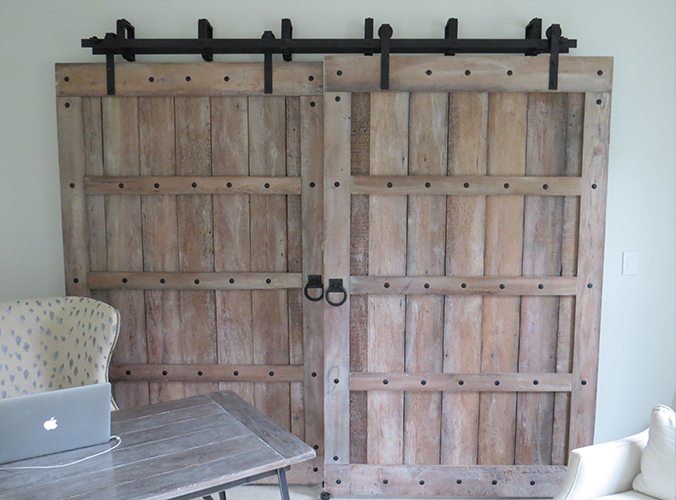 A barn door can become more than just the spot it covers! Christine and Jason of Auburn, Massachusetts wanted a set of large gray barn doors made from rough cut wood but on the slightly newer side. The wood used here was about 80 years olde and does work well in their modern space. It also has the rustic nature that The Barndoorist loves to work with. The doors would rest in the center of the living room space and when closed, and when open would cover two entries on either side of the room. The Barndoorist was also contracted to create the top section of the entry to the right in order to accomodate a barn door rail and its ability to move to this side of the room. The barndoorist built large pine header boards into the existing walls above the entry. He then used joint compound, and his skills with the trowel, to make everything work with the existing wall on the other side of this room. On the inside of the room, the barn wood header used to hold everything up covered the wooden header and was capped on its bottom with a strip of matching barn wood. The seemless construction and addition to the space made it possible to have barn doors work here and also to retain the look and feel of the home. The overall width of the barn header boards in the room exceded 15 feet. Julie and Scott of Kittery, Maine own a beautuful spacious home on the water and they love the nautical theme. 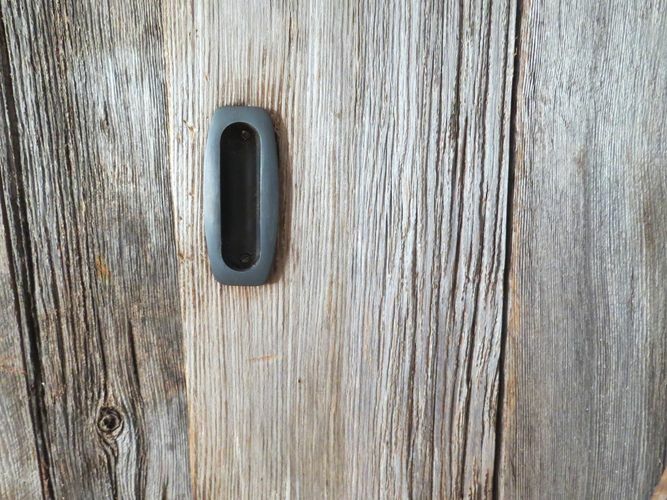 Many beach and sea paintings, knick knacks and beautiful pieces of art are found throughout the house and so to keep in tune, Julie and The Barndoorist discussed and arrived at using a cleat to make door handles! They were coated in the same rustic black the rest of the parts are made with and three beautiful doors were created in three different areas in the house. An upstairs doorway for an excercise room, a downstairs bathroom near the main entrance and the large door separting two living room spaces in the main open air centrally located great room. In the center of the oversized door is a tempered glass window set in with barn wood trim and it gives us light from the other room. Karen in Quincy, Massachusetts wanted a unique double chevron pattern on the two matching doors that would separate her dining area from the living room. Using olde gray wood from different lots that went together in style, The Barndoorist created lovely doors to compliment the modern interior of an older Massachusetts home. The Bambergs live in a beautifully outfitted, modern styled and spacious 3rd floor home in a large South Boston, Massachusetts house. They asked for doors done in gray to close off their dining area when they had company over and wanted to entertain while everyone's children could be in the living room playing or watching TV. The doors use 150-year-olde Vermont gray pine and they use classic "Z" and the "British Flag" style patterns. But one other unique feature is that their doors were done with double layers of wood. The backs of most gray wood are usually brown, because that's the inside of an olde barn, whereas the gray became its classic color from weathering the elements outside. But to make the insides gray as well, a second layer of vertical boards was added to all the doors. This makes for a stylish inside of the dining room and it also made these doors quite heavy to move upstairs and install. But the work is among The Barndoorist’s most proudly done and remains a signature-series project that is referred to continually for other customers who are considering colors and styles for their own homes.